Item number M1.148 from the MOA: University of British Columbia. Amber beads on cotton twine in the shape of a necklace. 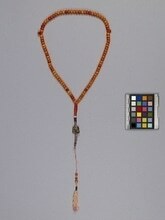 All of the beads are flat and oval shaped with the exception of two cylindrical shaped near the back of the group. There is one lozenge that ties the two ends together. The bottom section has a metallic, coiled knot the ends with twisted silk threads, three beads then a red and white silk tassel.